This safari offers more time in Murchison Falls National Park, Uganda’s largest National Park just within 4 days. Get time to view the wild animals, boat cruise, primate trekking at Budongo Forest and birding watching sessions which can be accompanied by hiking to the top of the falls. This morning after breakfast, drive North West to Murchison Falls National Park which is locally called Kabalega National park. The drive is approximately 6-7hrs depending on the number of stops made. With enough time, make a stop at the Zziwa Rhino sanctuary to track the remaining white Rhinos of Uganda. Have your warm lunch here and then proceed to the park, where you will have the rest of your evening with diner and overnight stay. Enjoy a morning game drive in the park tracks with your guide; this is the best time to spot the early raisers and the night walkers. Have a chance to meet the lions, giraffes, buffaloes, Jackson hartebeest, waterbuck, bushbuck and so many more. The afternoon boat cruise opens your eyes the numerous Nile crocodiles, hippos and the sun birds. 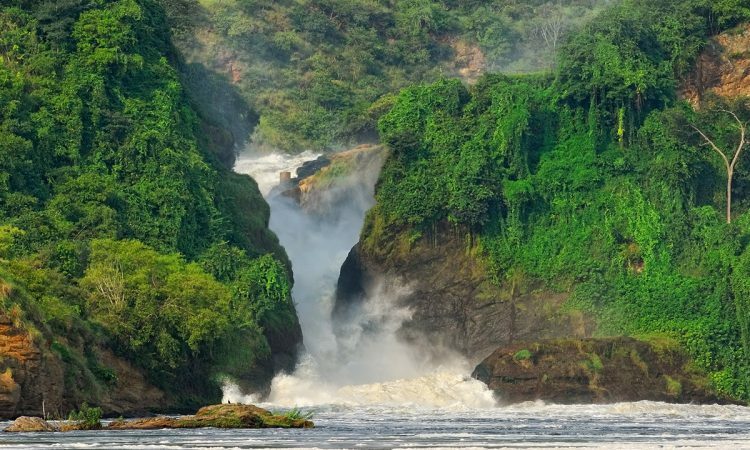 The cruise also leads to the bottom of the falls giving you a great view of Murchison Falls. If you are fit enough, you can hike to the top of the falls. Return to the lodge for diner and overnight stay. The adjacent Kanyio pabidi and Budongo forest offer interesting opportunities to encounter chimpanzees, red tailed monkeys, and black and white colobus monkeys. The royal mile is also a great spot to watch many of the birds that reside in Budongo forest. The tracking starts in the early morning with briefing and thereafter follows your guide through the forest to trek the chimps. In the evening enjoy more of an evening game drive, return to the lodge late evening for diner and overnight stay. Wake up to a leisurely breakfast and get ready to drive back to Kampala. Join your guide for transfer with a stop at the top of the falls. Proceed to the airport or to your hotel for diner and overnight stay ending your 4 Days Safari to Murchison falls in Uganda.